BYBR began after a drunken epiphany in a Wellington St apartment in Auckland Central in late 2006. In 2009, after scouting out the scene and doing some home work, we made business cards by hand and took them to every gig we could possibly find, beginning our 12 month mission to spread the word. We had a go at putting on a few events with some of the new bands that we discovered. After busting our asses off for a year we conquered the live scene and are now ready to take BYBR – and any serious artists – to the next level. BYBR creates a community network for musicians and aims to make being a 'professional musician' a viable form of employment in New Zealand. The focus is on assisting musicians to fund their projects through alternative means such as fundraising gigs, sponsorship and applying for artistic grants and funds. BYBR aims to work on a project-by-project basis, building a relationship with musicians to collectively achieve their artistic goals. One band that have signed on for the journey (and been with us since the very beginning), are the rock/prog/alt/awesome/facemelt 4-piece - initial. 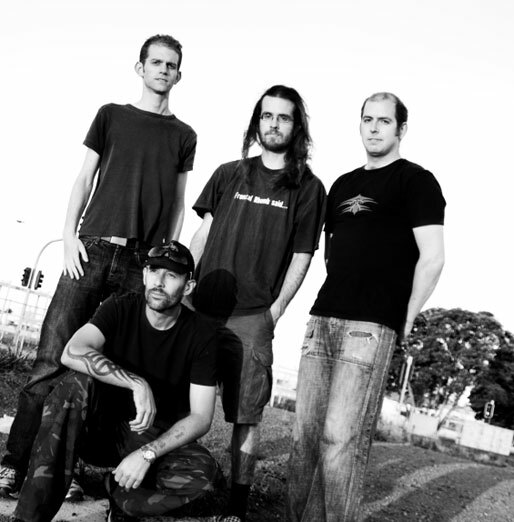 initial (spelt with no caps) are an Auckland band made up of Simon (guitars, vocals), Craig (bass, vocals), Oskar (drums, vocals) and Paul (guitars, keyboards, vocals). They have around 30 original songs ranging from dark thought songs to all-out neck-jarring, child-upsetting rock epics, and have recently recorded a three track demo CD at the Rock Factory. initial draw from their collective awesomeness, and incorporate the vocal abilities of all band members in their songs. Another band that we absolutely adore is Freaky Meat. Lead by super spoken word freak Shane Hollands and supported by fellow freaks John McNab, James Percy and Rod Redgrave, this awesome 4 piece now do a rock set as well as a jazz/blues/funk set. Describing themselves as eclectic Neo-JazzBeat with contemporary sensibilities, these trail blazers have always worked on dynamic combinations of spoken word and original music. They need to be experienced to be comprehended. 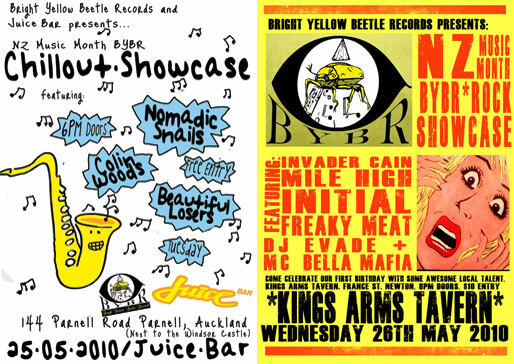 Every NZ Music Month, BYBR throw together events in several genres – most notably our Chillout showcases (featuring the likes of Nomadic Snails and Beautiful Losers) and our Rock showcases (featuring the likes of Freaky Meat, Initial, Invader Cain, and Mile High). BYBR use these showcases to present performance opportunities for up-and-coming bands to show off their skills. Splifftopia is a brand new monthly event (held on the third Friday of every month) that fuses the elements of the unique Boosh FM radio show ‘3rd Bass’ with the live arena of Coherent Nightclub. 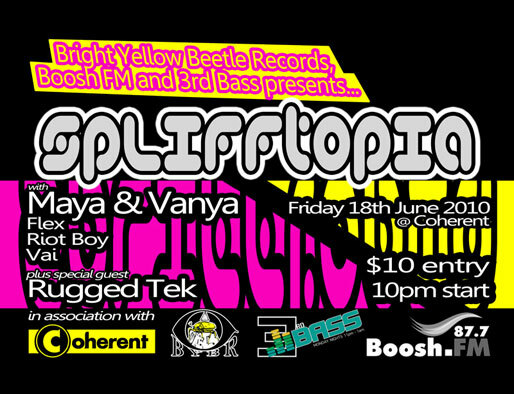 Splifftopia will take you on a journey through all your favourite genres (dubstep, drum & bass, house, UK Funky etc) lead by one of the most prominent, up-and-coming underground DJs: DJ Freecell (www.myspace.com/djfreecell). With live guest MCs and a new selection of the best local guest DJs every month, Splifftopia is an experience not to be missed. Juicy Beatz is a new experience created by BYBR in association with The Juice Bar in Parnell. The first one coming up on Saturday 3 July will feature live B2B sets from General Lee and Dan Aux as well as newcomers Savant and DJ Freecell. 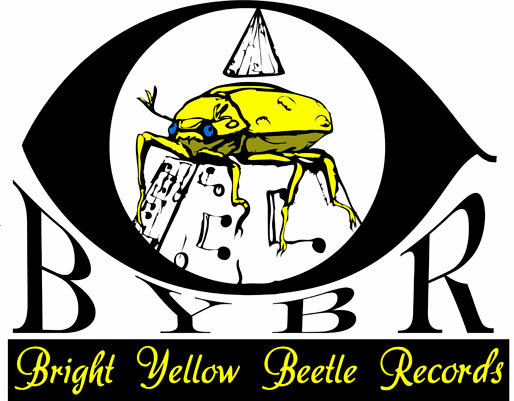 3rd Bass started on Boosh FM 87.7 in August 2009 and is supported by the team at Bright Yellow Beetle Records. The show is hosted by MC Darryl Projectile and showcases a unique mashup of beats from Resident DJ Freecell with live MCs plus new Guest DJ and MC talent every week. 3rd Bass airs Monday nights from 11pm-1am on Boosh FM 87.7 - best heard streaming online at www.boosh.fm. You can also chat to us online through the Boosh website during the show or text in on 022 01 BOOSH. If you would like to be a guest DJ or MC on 3rd Bass please email Tabitha on bybr@myspace.com. Keep it loud for mint beats, live MCs, fresh DJ talent, a weekly gig guide and more. Outward Sound is pleased to announce the 2nd round of grant recipients for 2010. 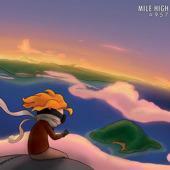 Midnight Youth - to market, promote and tour the release of their album The Brave Don’t Run in Australia through Warner Music. Kids Of 88 - to showcase and promote their debut album through Sony Music. Lawrence Arabia - to promote the release of critically acclaimed album Chant Darling (through Bella Union) in the USA and Canada including high profile showcases supporting Crowded House and Flight Of The Conchords. Connan Mockasin - to promote the release of Connan’s debut album Please Turn Me Into The Snat (through Phantasy) in Europe and the UK including high profile showcases supporting Crowded House. The Black Seeds - showcase tour of the US supporting the release of their album Solid Ground in North America. Dawn Raid - to facilitate re-launch of the label in the US with new partners SMC/Fontana. Electric Wire Hustle - showcase tour of the UK and Europe supporting the release of their debut album through label BBE. I Am Giant - showcase performances in the UK, Australia, Asia and the USA. Kirsten Morrell - showcase performance at the Isle Of Wight Festival and to pursue further opportunities in the UK. LA Mitchell - to capitalize on opportunities created in the UK and the US including a showcase at Toast. Pistol Youth - pre album release set up for the band’s debut album in the USA, UK and Europe. The Early Birds - to showcase at Australian Song Summit. The Naked And Famous - promotional tour of Australia in support of their debut album including showcasing at Big Sound in Brisbane. Applications for the next round of Outward Sound grants close on July 26th at 5pm. This is our fourth New Recording Artist funding round and our fifth Music Video round for the 2009-2010 funding year. We got 282 applications for one of the five New Recording Artist funding packages, and another record-breaking figure of 234 Music Video applicants for 32 Music Videos. For our New Recording Artist funding, 68 songs made the first shortlist, the number was reduced to 34 in the second shortlist, leaving 10 contenders for the third shortlist. Out of the 10 finalists, five projects have been chosen. 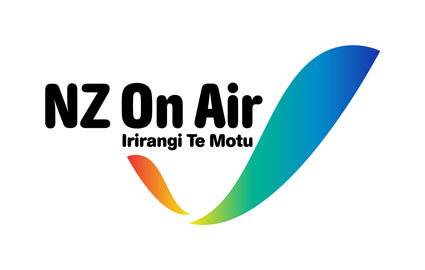 For the Music Video funding we found 32 projects, based on feedback from the music television broadcasters when we tested the songs and our current radio priorities. 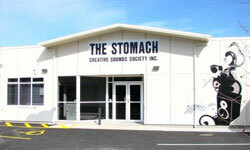 Due to a 33% reduction in the funding The Creative Sounds Society Incorporated (CSSI) aka The Stomach receives from the Palmerston North City Council, they are having to reconsider the services provided by The Stomach. This cut in funding will take place from July 1st this year. As the funding covers staff salaries, they are currently investigating having one full time staff member only. The second staff member would be made redundant. This is expected to take place at the end of July. Open hours will be Tuesday to Saturday 12 noon to 8pm. The Stomach will be closed on Sundays and Mondays. With only one staff member they will be unable to appropriately supervise events. The last event to be hosted by The Stomach will be the 10th annual Feedback the Foodbank benefit show on August 13. The annual Palmerston North Music Festival SwampFest is not expected to go ahead. The Stomach does a fantastic job of supporting music in the Palmerston North community with the services they provide. The Stomach is also the only all ages venue in Palmerston North. You can check out every single interview and review in our new Articles Page. and will feature I Am Giant! There is space available for features from 4 July onwards. You can request a date in advance, or feature in the next available issue. We can feature you even if you have featured in a newsletter from a previous year. Our newsletters are sent out to over 8150 members and with this number growing every day, featuring in our newsletter will provide excellent exposure for you or your band. And, as the people who receive our newsletters have subscribed to them, they are more likely to read what you have to say. Our next gig mail out is going out on 27 June.